BANGKOK (Reuters) – Partial results from Sunday’s general election in Thailand showed a pro-military party slightly ahead of the populist party leading a “democratic front”, an unexpected outcome from a poll that had long been delayed after a 2014 army coup. 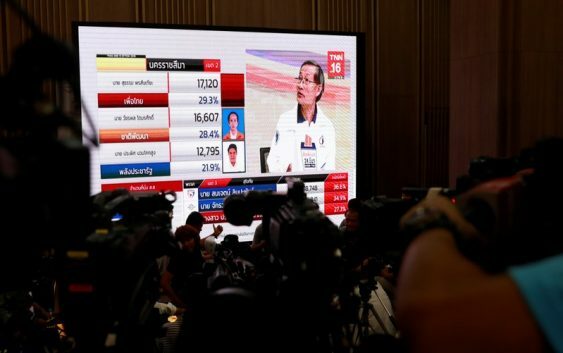 After polling stations closed, Reuters incorrectly reported Thai PBS TV channel announcing numbers from an exit poll but the seat numbers for the competing parties that it aired were from the last pre-election opinion poll. Thai PBS’ figures came from research center Super Poll. “We apologize for our staff’s miscommunication to Reuters that we conducted an exit poll,” said Paweenrat Sukpongpimon, a statistician at Super Poll.